Following victory for the Netherlands last night, our No. 4, and goalscorer on the night, has issued a warning to Matthijs De Ligt by suggesting his Oranje teammate still has a lot of scope for improvement. Still at the tender age of 19-years-old, De Ligt is drawing admiring glances from European football’s cream of the crop clubs. The teenage Dutchman has impressively marshalled Ajax’s defence in a manner that belies his callow youth. That said, when quizzed on his teammate, Virgil Van Dijk answered: “What can De Ligt improve? In everything”. “He is an excellent defender, but he also knows he can improve. We’ll be hoping that the two of them are standing next to each other at Liverpool, but that seems like a bit of a long shot at the moment. It’s Barcelona that seem to be in pole position to bring the precocious Netherlands international to the Camp Nou. Having already signed his Ajax teammate, Frenkie de Jong, it seems likely that De Ligt might elect to follow him there – well, that, coupled with Barça’s Dutch heritage and the Johan Cruyff factor. 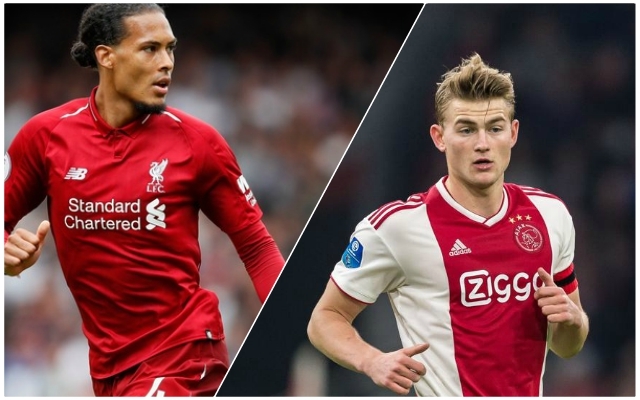 Van Dijk’s comments might be taken as a broadside attack on Barcelona’s efforts to sign De Ligt; by highlighting the fact that De Ligt is still the unfinished article, he might be counselling the young centre-back to consider a move to Anfield. Under Van Dijk’s tutelage and Jürgen Klopp’s paternal bear hugs, De Ligt could find the perfect atmosphere to further develop as a world-class player for us.